The final production at Alphabetti before the New Year’s Eve celebrations is a club sandwich of Christmas reality served between slices of sweet musical sing-along jam. Our host Becky Musgrove handed out mince pies as we took our seats and Becky started the community singing with ‘Let It Snow!’. The effect of the music at this stage in the show was to gel the audience together before the first play. You may know him by a different name. Santa Clause, St Nicholas, Father Christmas. Meet the Jolly Elf. He actually isn’t that Jolly. He’s also not an Elf. He’s filled in for the Tooth Fairy and the Easter Bunny too. But when the magic has gone what does that mean for Frank? Sherry. In a pint glass, that’s what. Frank is having to adjust to a new type of Christmas. He has gone from being a Dad and playing Santa to his children to having grown up kids that don’t plan to spend Christmas with him. Gary Kitching’s script has Tony Neilson flipping between his character Frank and Tony apparently as himself with a flip of a Santa hat. There is that nice contrast between Frank’s own childhood and the traditions that he set up with his own children. Some memories of the crap toys that were available back in the day reignited the memory of the older members of the audience. Seeing the black and white adverts on the screen added to the sensitivity of the piece. 6am Christmas morning, and Tina’s just polished off a bottle of Bucks Fizz on her way home from the night shift. Hope you’re ready to receive her presents...? You have to give it to nurses. They do 12 hour shifts in a professional manner and then they go home for Christmas. To what do they go home to? Tina is such a nurse and she lands at home and quickly realises that with all of the recent stress she has forgotten to buy the food for her Christmas meal. But that’s the least of her problems as she decides to open and re-wrap the presents that she had bought her ex-partner Richard. We get to witness the trauma of a relationship break up after a 12 hour shift wiping bums and clearing vomit. Matt Jamie directs a very fluid performance. Louise Taylor has written a coherent piece which has Rosie Stancliffe showing the full emotional nightmare that Tina finds herself in. The only worry is the apparent amnesia Tina shows as she seems to have forgotten a lot about the gifts that one assumes she had bought and wrapped herself. With a bottle of fizz in one hand Paula Penman enters the stage with a packed case in the other. However as the display on the bus stop states, it is Xmas day and there will be no buses today. She has left her husband asleep after he returned very drunk from the club. Karen Traynor directs a gripping tale of excessive credit card spending and marital disharmony resulting in the escape to the local bus station. Though it is a troubling story, the Steve Byron script coupled with Paula’s infectious energy means there are more opportunities for the audience to laugh than some recent pantos we’ve seen. It is a believable performance which you suspect is far too common across the country as alcohol turns relationships sour over the so-called festive season. It is an excellent end to the drama this evening however we have one final song in the shape of my favourite ‘Fairytale of New York’. The singing between each drama raised spirits – juxtaposed between the sombre feeling of the plays and the perceived jollity of what Xmas is about. The song choice was also clever as each song links in with the action too. 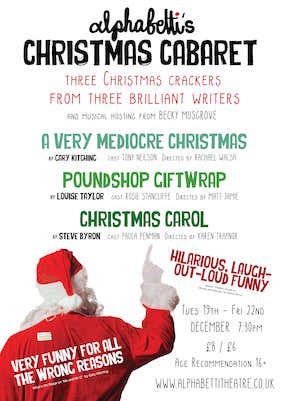 This is a Christmas Cabaret like only Alphabetti delivers.